Civil liberties may have to be "eroded" to protect Britons from terrorism, the head of security service MI5 has said. In a speech made in the Netherlands on 1 September and put online by MI5, Dame Eliza Manningham-Buller said the world had changed and a debate was needed. 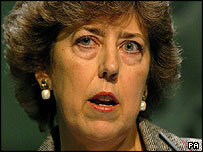 She said the July London bombings were a "shock", which MI5 and police were "disappointed" they could not prevent. Former MI5 agent David Shayler said any liberties lost would be hard to regain and could make "martyrs" of terrorists. Mr Shayler told BBC News questions still needed to be asked about how the 7 July suicide bombings happened. "It's made apparent how MI5 fails to stop attacks even when in possession of intelligence because of bureaucratic inertia," he said. Mr Shayler, of Middlesbrough, was jailed for six months in 2002 for revealing intelligence service information to a newspaper. He said he had been motivated by a desire to expose abuses of power by the intelligence services. Dame Eliza spoke on countering the international terrorist threat at the 60th anniversary celebrations of the Dutch security service, the AIVD, in The Hague. She said those working in intelligence were also aware of many more attacks that had been thwarted by good intelligence and police work, but that those successes had usually been "quiet ones". "We are judged by what we do not know and did not prevent," she said. She said difficult decisions often needed to be made on the basis of intelligence that was "fragmentary and difficult to interpret". "Some is gold, some dross and all of it requires validation, analysis and assessment. When it is gold it shines and illuminates, saves lives, protects nations and informs policy," she said. "When identified as dross it needs to be rejected: that may take some confidence." The central dilemma, said Dame Eliza - director general of MI5 - was how to protect citizens within the rule of law when "fragile" intelligence did not amount to clear cut evidence. Such intelligence was often not enough to support criminal charges in the courts, she said. "We can believe, correctly, that a terrorist atrocity is being planned but those arrested by the police have to be released as the plan is too embryonic, too vague to lead to charges and possibly convictions," she said. "Furthermore the intelligence may be highly sensitive and its exposure would be very damaging as revealing either the source or our capability." She said civil liberties were valued and there was no wish to damage those "hard-fought for" rights. "But the world has changed and there needs to be a debate on whether some erosion of what we all value may be necessary to improve the chances of our citizens not being blown apart as they go about their daily lives," she said. Lord McNally, leader of the Liberal Democrats in the House of Lords, said his party and the Conservatives had said they would work with the government in examining any loopholes exposed by the bombings. "But I think we've also got to examine what existing powers were not used properly," he said. Parliament had a "heavy responsibility" to see that any new powers were explained and justified, he said. Labour MP Stephen McCabe, former parliamentary private secretary to the Home Secretary Charles Clarke, said all new laws would be subject to normal parliamentary procedures. But he added: "If there is any possibility that we're going to have new powers that do curtail recognised freedoms then it's important that people talk at an early stage about the kind of issues that may be under consideration. "It's important that they're out in the open and there is actually public debate about the needs and the risks and the reasons." MI5 has recently let it be known that it is in favour of making telephone intercept evidence admissible in court. Previously the intelligence and security services had expressed concern such that evidence might reveal operational details. Meanwhile, Home Secretary Charles Clarke has been calling for EU states to keep mobile phone and e-mail records for longer, to help fight terrorism and crime. In Britain, mobile phone companies retain the records for varying periods of up to 12 months, but Mr Clarke would like to see that extended to three years. He has said telecommunications data proved valuable in the investigation of the 7 July London bombings, when four suicide bombers killed 52 commuters. Two weeks later, there were four attempted bombings on three Tube trains and a bus, but no-one was injured.